High dissipation loss of electronic units/components with a simultaneous increasing of their miniaturization and packing density are causing thermal hotspots that need to be suspended on large-scale. This dispersion and heat eduction finally are a passive cooling of the components. Without this cooldown a high failure rate may occur, at least the life-cycle of units and component groups will be seriously reduced by overheating. Typical application fields for circuit boards with thermal management are LED-applications, engine control, switch-mode power supplies and semiconductor switches. Your circuit board has a significant role for an effective heat management: the thermal system Circuit Board and the capability to lead through and off the heat is finally specified by a complex layout of thermal single resistors. Those single resistors result from material specific parameters (heat conductivity values) and constructive parameters (layer thickness, surfaces). use an FEM-based simulation software. In order to dissipate the heat from the inducing parts (components) out of the circuit board, the conduction (heat conduction) within the circuit board and as well the possibility of heat eduction to the environment (convection) thus need to be improved in general. That means at first a reduction of the thermal resistors within the layout and the implementation of heatsink layers for a better heat spreading and environment eduction. There are several different technological concepts for the realization of these general requirements. 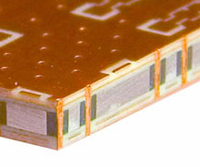 The biggest thermal resistor is always within the dielectric interconnection layers. The material-specific Parameter Heat Conductivity is here worse than copper by a factor of 100 (at so-called heat conducting prepregs) up to a factor of 1500 (standard FR4)! Thus, it is needed to keep those layers as small as possible and, if applicable to bypass with so-called thermal vias. This concept has well-proven especially with multi-layer switchings. Single switchings with a low layout-complexity can often be realized with an electric layer. The thermal load of equipped components is simply led-away by a very thin and highly heat conductive dielectric fluid onto a fullsurface heatsink layer which is placed on the outside. This conventional IMS (Insulated Metal Substrate) – Technology is mainly implemented in LED-applications. For this purpose, we purchase IMS-substrates in various designs (Heatsink Aluminum or copper, dielectric thicknesses, thermal conductor value of the dielectric, etc.) and finish them in our processing. Already with simple designs there are many possibilities to manage heat efficiently. A wide range of single-layer IMS (Insulated Metal Substrate) materials are available as standard. Depending on the application, you can choose between aluminium or copper cores in thicknesses of 1.00mm - 3.00mm. The thermally conductive dielectric is usually 75 or 100ìm thick, the thermal conductivity is between 1-3W/m*K depending on the type of material. 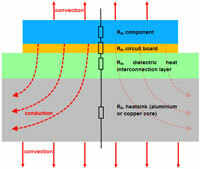 The copper foil for the electrical layout can be selected between 18-210ìm. CONTAG keeps a large number of material variants from two market leaders of IMS substrate manufacturers in stock. Furthermore, there are several options for a combination, such as: e.g. multilayer switching with a metal-core, or a substrate subsequently bore from the outside, in connection with heatsink-filled vias with a random number of layers. However, the resulting disadvantage here is that in comparison to the above values the heat conductivity sinks evidently. This results on the one hand from the combination with FR4-material (heat conductivity only approx. 0.3 W/mK) and on the other hand it is unlike harder to derive the heat from a metal-core placed inside. partner at your side for these solutions. Our CONTAG-experts will advise and attend you throughout the process, from the construction and design phase until the prototype and series production. Suitable thermal management on the printed circuit board provides the layouter with suitable solutions for the specific application. With CONTAG AG you have a perfect partner at your side. We work with you to develop technologically functional and cost-optimized solutions. We advise and accompany you from the development phase through prototype production to series production. For further technological questions on the subject Circuit Boards please refer to our CONTAG-Team (phone +49-30- 351 788 – 300 or team@contag.de).